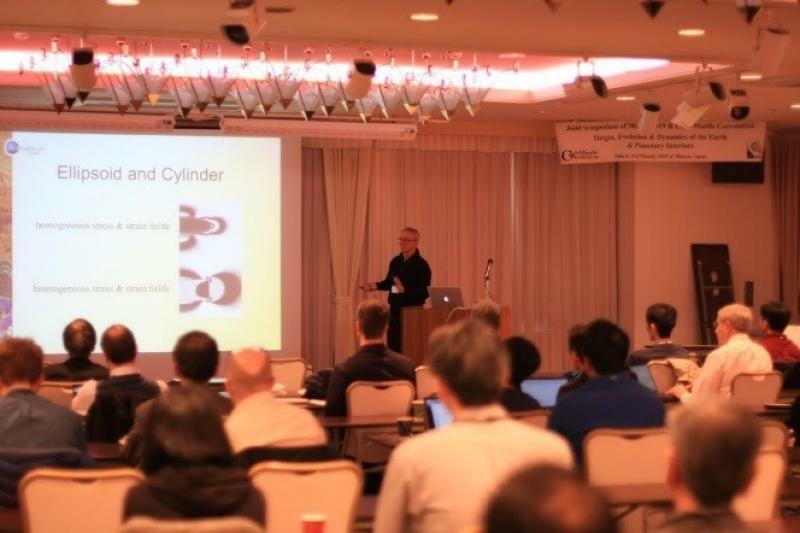 The international symposium “Misasa 2019 and Core-Mantle Coevolution” on the Origin, Evolution and Dynamics of the Earth and Planetary Interiors was held on March 18-21, 2019 at a hotel in Misasa, Tottori. 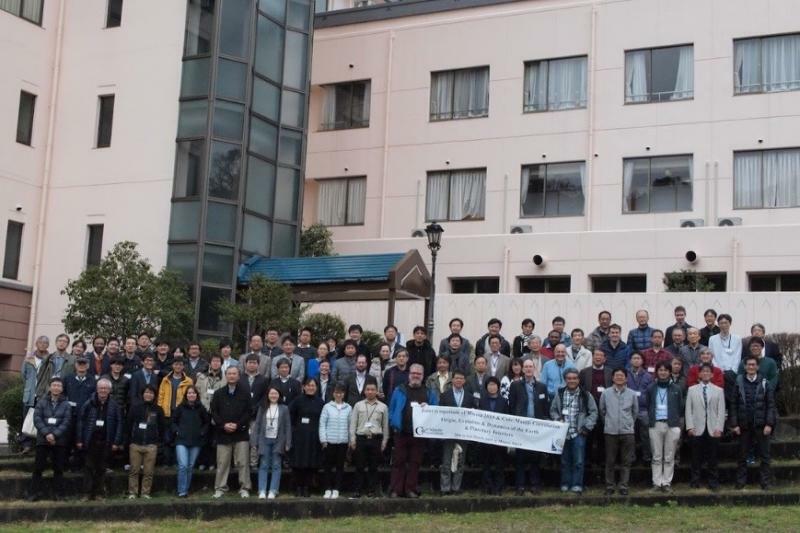 This is a joint symposium co-organized by the Institute for Planetary Materials (IPM) of Okayama University and the MEXT Grant-in-Aid for Scientific Research on Innovative Areas project “Interaction and Coevolution of the Core and Mantle”. About one hundred domestic and international researchers, students and others working on frontier research on the origin, evolution, and dynamics of the Earth and planetary interior joined the symposium. 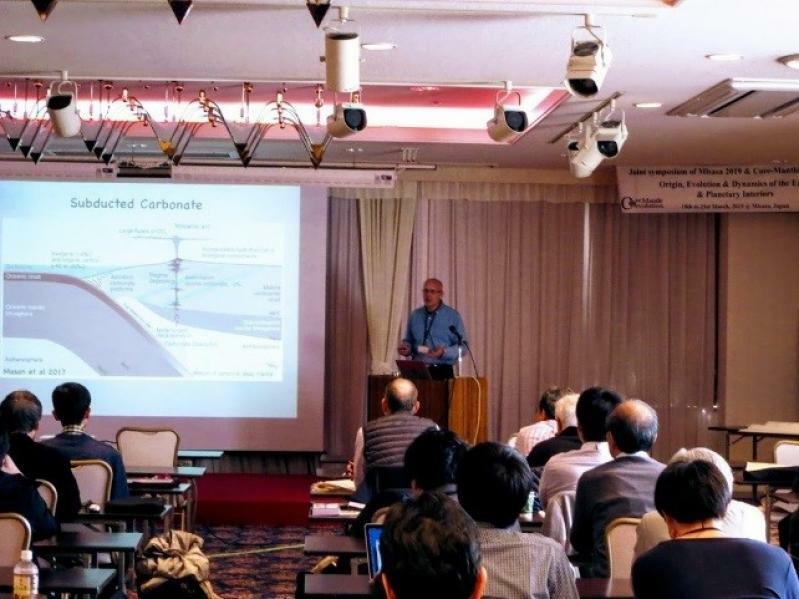 Presentations were given by eight invited international speakers, including Dr. Michael J. Walter, director of the Geophysical Laboratory, Carnegie Institution of Washington (USA), Dr. Dave Mainprice, professor of Montpellier University (France), Dr. Tomoo Katsura, professor of the University of Bayreuth (Germany), and Dr. Andrew Thomson, lecturer of the University College London (UK) and general speakers in six scientific sessions over four days. The topics span not only those in mineral physics and geochemistry, including material circulation of water and carbon dioxide in the deep Earth and the composition and structure of the Earth’s interior, which are major research fields of IPM, but also those in geo-neutrino, seismology, and electromagnetism. Collaborative researches conducted at IPM by domestic and international joint researchers were also presented. Active discussions also took place during the question period, which serve to catalyze comprehensive understanding of the coevolution of core-mantle or the inner structure of the Earth and terrestrial planets, leading to future development of the field. It is hoped that this symposium has fostered new collaborative research relations and new interdisciplinary research concepts between IPM and other domestic and the international researchers. We will continue our endeavor to promote Earth and planetary materials science as a Joint Use/Joint Research Center.